In today’s world of Social Media, the definition of IT literacy has changed. Teachers and Students need to understand and use Social Media effectively to enhance their career. It does not make a difference whether they are in the IT field or any other field. 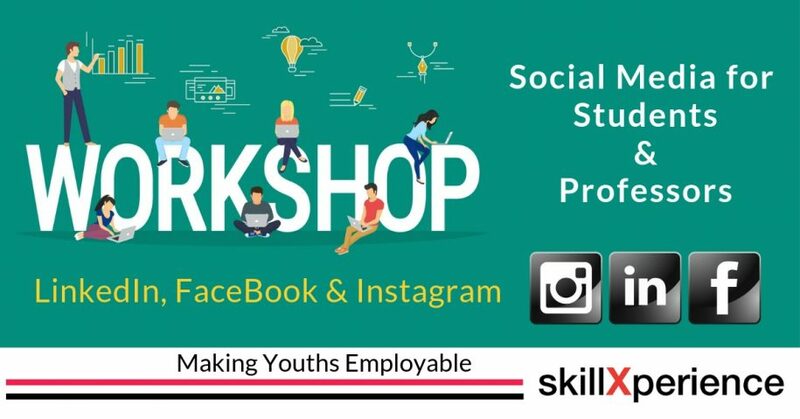 We have designed a special 120 Minutes workshop for Social Media for Students, Professors, and Teachers where we cover LinkedIn Training (Mainly), Facebook Training (partially) and Instagram Training (somewhat). Social Media workshop enables Students and Professors to utilise the power of Social Networks to their advantage. Before we go into details of the content of the Workshop. Let us briefly understand why we need to understand and use these three Social Media Platforms. It’s the largest professional network on this planet. Whether you are looking for a Job or increasing your business, you cannot ignore LinkedIn. It’s also the largest source of Professional news and knowledge on the Internet. People share their professional information and news on this platform. It’s a great place to get connected to fellow professionals, Employers, Customers etc. Facebook is the largest Social Media platform on this Earth. Generally, Facebook is used to share Personal and Social information online. Most of the people above 30 are on Facebook and most of the student community is on Instagram. Instagram is basically a photo sharing App. But it has lots of other features, around photos. While there are many other Social Media sites, we are mainly focusing on these three only, because they are most popular in India. Social media can be used to enhance your professional Life, Only you need to know how. The tips and tricks shared in this workshop will enable you for that. Who needs Social Media Training? In today’s world, the meaning of literacy has changed. Very good working knowledge of Social Media is a must for any kind of profession. Just knowing how to open and post something on Social Media does not mean that you know it. Science & Engineering: B. Tech, M. Tech, B. E., M. E., BCA, MBA, Diploma courses. Medical, Pharma, Biotechnology etc. Any Other: Any other stream of learning. The profile you create, and content you post creates your personal Brand. You may not be aware of it, but more and more companies are using Social Media sites for screening and analysing candidates. Creating and maintaining a LinkedIn Profile. Writing a LinkedIn Summary which will attract more visitors. (Read Recruiters). How to engage and build a relationship with your connections. How to find your future employers and how to get noticed. How the concept of Influencer marketing works for getting Jobs. How to highlight your skills and your projects that you on LinkedIn. Learn how to use Linkedin on daily basis. Making it part of your daily/weekly routine will help you to take maximum advantage. What to share and what should not be shared. Tips and Tricks of using LinkedIn on Web and Mobile. LinkedIn learning (a free add-on to Premium LinkedIn account) can be great source of learning. How to apply for Jobs online VIA LinkedIn. Most of well known companies use LinkedIn for recruitment. Recruiters rely more on your Social Media profile than your Resume. So maintain it that way. Most of students (younger generation) thinks that FaceBook is very complicated and for older genration only. But, there is lot that FB can add, especially to your Career. Remember, Your future boss or recruiter might be on FB. Managing Events, Groups and Facebook Pages. (and why they are needed). How concept of Social Selling can help you to get better Job and Better Business. Many companies post of Jobs on Facebook. How to search and apply for the one and how to get alerts for the same. It is as simple as it could get, at the same time. Its as complicated as possible. Learn how to be Instagram influencer by sharing regularly and consistently. We at SkillXperience help colleges to get connected with Industry. The Purpose and Goal of SkillXperience is to Make Youths Employable. We can do this workshop in your College, absolutely free of cost. Currently (as of Feb 2019), we are serving Geographical Area from Chikhli (Gujarat) to Boisar (Maharashtra). Go to Participate Section (Menu) above and fill up the form. Please Check the option for “Social Media Workshop” while submitting the form. Click here to go to Participate Section. Alternatively, Just leave a comment and we will get in touch with you.